You may have become bored of your regular workout schedule. It is truly not easy to wake up early in the morning and head out to a gym club. If you do not love this strict routine, do not feel depressed as there is an alternative available for you, that is, kayaking. You can take your kayak and start your paddling session right away. Most of us think that kayaking is only suitable as a recreational sport. However, you will be surprised that kayaking can be more effective than most sports in the calories and body toning department. In this article, we have come out with the top 9 benefits of kayaking. With consistent paddling at 5mph, our body burns almost 400 calories on every hour. You may choose your afternoon hours to do kayaking continuously. Your body will surely burn at least 1600 Calories. Although running is also a very common way to burn those calories, most of us will stop running after an hour. However, you can easily continue kayaking for long hours. As it is an aerobic workout, it increases blood circulation in your body. It also enhances the release of endorphin hormone and reduces your fatigue. Your immunity will also grow stronger. Kayak paddling is also good for those who have cholesterol issue. It increases the healthy cholesterol, decreasing the level of the unhealthy one. This aerobic sport strengthens your cardiovascular health. Your heart becomes stronger with the regular kayaking technique. You may have spent eight to ten hours in your office. Your boss has asked you to manage loads of job. Now, it is the time to forget all of the stress and get into your kayak. While your kayak floats on a small lake or river, you get the utmost benefit from this outdoor activity. The reduction of stress will also result in a clearer-thinking ability and a sound sleep at night. Click here if you are looking for the best kayak for rivers. Kayaking is an activity that promotes positive thoughts. You will enjoy every moment throughout your kayaking trip. You will also feel better mentally and emotionally while you are moving your body, propelling your kayak forward. This activity causes the release of endorphins from your brain. In order to reach your destination while kayaking, you have to remain focus. You do not want to stumble upon large branches or logs that will cause capsizing of your kayak. There will definitely be no time for you to play with your smart phone too. This water sport will surely increase your determination and the level of focus. The calm, tranquil surroundings at the time of kayaking always creates a good sensation in you. To increase the benefits from kayaking, you can add fishing activity to it. While you are on the kayak, you can use all the accessories for angling. We usually move our torso and hands for kayaking. Thus, you may think – How could I shape up my legs doing this activity? You may not need to move your legs frequently for kayaking. However, this doesn’t mean that those legs are of no use in this activity. You use your legs for applying pressure for your own safety in the kayak. Your legs play a role to maintain balance and to control the kayak. You will be tightening and loosening those leg muscles several times while navigating through the water body. This will increase the strength of your leg muscles. You will notice the frequent movement of the kayaker’s shoulders. It is a type of workout even for your shoulders. For every stroke, you are moving the paddle to drive forward and this causes the movement of the shoulder. The bigger muscles at the lateral and rear side of the shoulders will benefit from your paddling technique. The way you grip the paddle also plays a role when using your muscles. Paddling causes a positive effect on the chest. You use dumbbell and various other kits for increasing your chest strength. However, the motion for paddling improves your pectoral muscles. It also helps in stabilizing your shoulder. This vitamin is highly essential for the proper functioning of our body. Kayaking is the best option to retain this vitamin in your body. Continuous sun-rays for ten to fifteen minutes can increase the level of vitamin D.
However, due to how fun kayaking can be, you may easily spend hours under the sun. Therefore, always remember to apply sunblock to help protect against the UV sun-rays. 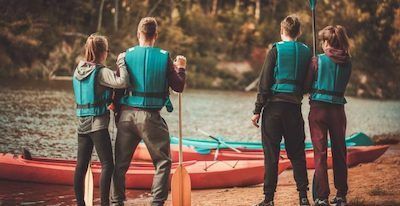 If you love socializing, kayaking will surely be for you. In the lake or small water body, you will surely find several other kayakers. It will be fun exchanging some kayaking tips and ideas with each other. You can also join forces with other kayakers if your kayak happens to be a 2 or 3 person kayak. There are also a fair amount of clubs or training centers around to help you improve your kayaking skills. Furthermore, kayaking with a group of kayakers will surely result in a fun and memorable trip. We hope that you have enjoyed our post on the benefits of kayaking. 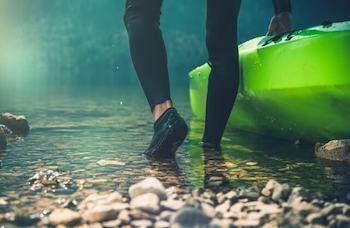 However, before jumping on to your kayak, it is important that you follow the tips below for optimizing your positive outcome and minimizing your risk of injury. After every paddling session, you may apply ice to different parts to reduce soreness. Once you are ready, it’s time to have a twist to your present workout routine. Enjoy kayaking in the lap of green nature. This water sport is beneficial for people of all ages. Whether you are a teen or a middle-aged person, paddling is the best way to shape up your body and to refresh your mind. Kayaking is one of the low-impact sports and hence can be included as your regular workout routine. What’s more, within a very short time, you can learn kayaking easily. All you have to do now is to get a trustworthy kayak, look for a nearby water body to start kayaking away.